During the cold and dry winter months you should maintain smooth, soft lips and prevent chapping. I apply a good amount of lip balm to my lips every night before I go to bed. I always keep several lip balms on me, in my purse, or in my car, and I am continually applying them throughout the day. My hands down favorite is Aquaphor's Lip Repair and Protect. It keeps my lips smooth and moisturized, and contains an added bonus of SPF 30 (more on why that is important below!). One additional step you should take to protect your lips is to exfoliate, or remove the dry, dead skin. Instead of purchasing a lip scrub I usually make my own with this DIY Easy and Natural Lip Scrub recipe. Skin Care Tip #2: Moisturize, Moisturize, Moisturize! Using oil-based moisturizers that include Vitamins C and E will keep your skin hydrated for longer than water-based moisturizers. My go-to favorite for years has been Eucerin's Intensive Repair Dry Skin Lotion. It is ultra moisturizing, intensely hydrating, fragrance free, and will help protect your skin against the harsh winter weather. Moisturize twice a day, even when you are tired and don't feel up to it. I moisturize both body and face once in the morning and once in the evening. You should always use a more gentle lotion for your face that is specifically designed to deal with this ultra sensitive area. I have been using Clinique's Dramatically Different Moisturizing Lotion for many years, applying it to my face and throat in the morning before I apply my makeup, and in the evening after I wipe it off. Apply a hand cream regularly and always keep some handy at your office desk, in your purse, and in your bedroom. Don't forget to continue using SPF during the winter months, as the sun's UVA and UBV rays can still cause damage to your skin even through cloudy winter skies. You skin and body is craves as much water during the winter as it does during the summer. Drinking eight 8 ounce glasses of water per day helps our bodies maintain fluid balance, and rejuvenates and hydrates our skin. Water is key for your skin cell's ability to repair themselves and maintain elasticity. Two weeks ago I purchased this Hydr-8 Time Marked Water Bottle in the color purple and is has made such a difference in my water intake. It helps me feel hydrated throughout the day by allowing me to track my water intake in two hour increments. I have felt more energized and hydrated during the day than I ever have before. 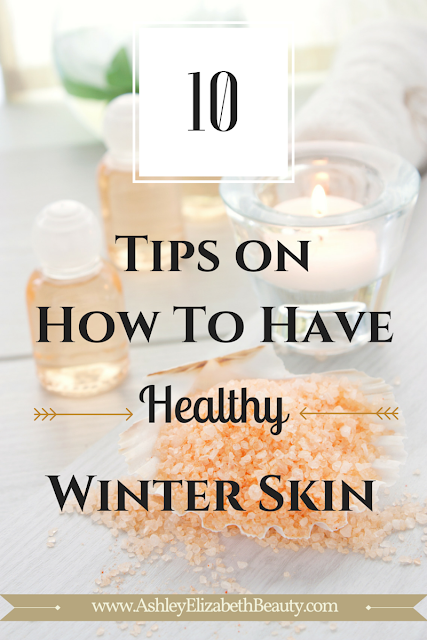 Exfoliating your skin 1-2 times per week will rid your body of excess dry skin, which tends to be a bigger problem during the colder months because our skin is exposed to more dry, cold air. You can find exfoliating body scrubs in the beauty and skin care section of every store you walk in to, but I absolutely prefer to make it myself using this DIY Natural Coffee and Coconut Body Scrub recipe. You can make a lot of it very cheaply, and the smell is amazing! Prevent your skin from developing redness, dryness and cracking by wearing gloves. Simple, right? It's an extra step that goes a long, long way towards healthy skin. Go to the store and pick out a pair that is not only fleece lined to protect your hands, but also cute and functional. I purchased these North Face Denali Women's Gloves a few years ago when I went to the 2012 Presidential Inauguration in a frigid cold Washington, D.C., and it was a great investment. Dry and itchy skin in the winter can be aided by adding more moisture into the air through a humidifier. I use my Honeywell Console Humidifier at night on the lowest setting to help me breathe better and infuse humidity into the dry air. This specific one is extra large and designed for multiple rooms, but there are plenty of smaller humidifiers on the market made for smaller spaces. Astringents, such as those found in acne treating medications or products, can be very drying to the skin. While it may not be reasonable for you to completely cut these out of your skin care routine, it may be best to at least try to cut back or find a natural alternative. I have been using this DIY Rose Facial Toner recipe when I am in need of a gentle and cleansing astringent that will not dry out my face or cause flakiness. I've been guilty of it over and over again: standing in the hot shower on a cold day because it feels so amazing. However, this is sadly not so great for your skin. Avoid hot showers and keep your bathing time between 5-10 minutes, as too much hot water can dry out your skin. Take a warm shower and use a gentle cleanser to wash up. Attempting to cover dry skin with makeup is one of the worst things you can do for your skin and your overall appearance. If your face is dry and flaking, it will only look worse with makeup over it. Makeup will adhere to those dry patches of skin like butter on popcorn (...yum...). Exfoliate your face and continue to use a good moisturizer, such as the Clinique Dramatically Different Lotion I mentioned earlier. My favorite exfoliating face mask is the Origins Clear Improvement Active Charcoal Mask, which deeps cleans to clear pores of dirt and debris, and leaves your face fresh and exfoliated. Food items, such as olive oil, avocados, grapefruit, broccoli, almonds, dark chocolate and green tea, all contain nutrients and antioxidants that will make your skin glow this winter season. Sit down at night with a book and a cup of green tea, have a small handful of almonds as an afternoon snack, or spread some avocado on your toast in the morning.